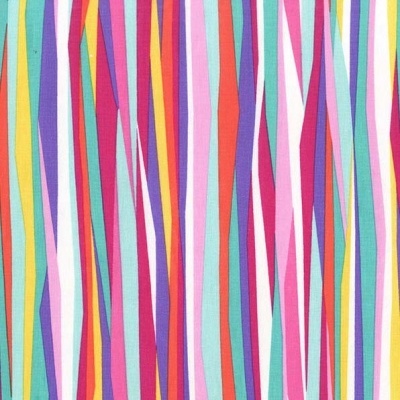 Multi coloured ribbons design, 100% cotton from the Michael Miller Mer-Mates cotton collection. 112cm / 44" Width, this fabric weighs approximately 150gsm. Multiples of a size will be cut as one piece unless requested otherwise. Michael Miller are a New York based company started in 1999 by two friends Michael Steiner and Kathy Miller. From humble beginnings in a residential flat, they now employ over 20 people producing a wide and varied range of fabrics.